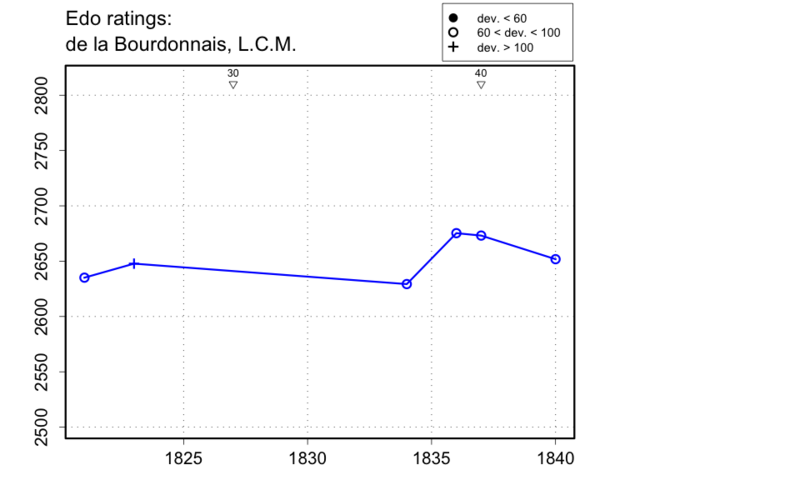 Edo Ratings, de la Bourdonnais, L.C.M. Gaige has birth year 1797. Hooper and Whyld have birth year 1795. Staunton in the Chess Player's Chronicle (1841, v.1, p.267) says that he died at age 43, which implies a birth year of 1797 (or very late 1796), but in a footnote to a letter of William Harris (1842, vol.3, p.12), Staunton gives the birth year 1795, citing Le Palamède, and therefore age at death 45. Le Palamède (2nd series, v.1, p.16) gives birth year 1795. Bell's Life in London (13 Dec. 1840, p.4) says 'De la Bourdonnais was born in 1797: we have hitherto thought him older.' The Liverpool Mercury (25 Dec. 1840, p.422) says he died 'about 45 years of age'.